Ridley Scott’s GLADIATOR was released in the U.S. on May 5, 2000 - a few months before I’d left for Europe. I didn’t see until it was released on home video some time after I’d returned home. So, I wasn’t seeking its filming locations or even inspired to visit Roman ruins because of it. Instead, my wanderlust had been fueled by my college architecture history classes. From them, I knew that Rome's Colosseum was not the only ancient amphitheatre in existence. In fact, there are many and I thought it might be fun to see how many I could visit. I ended up seeing a dozen during the course of my travels. The first arena I visited was in the northern Italian city of Verona. I was headed by train from Venice to Florence and went a little out of my way to make a morning stop in Verona to see it. From the train station, it's a few blocks' walk northeast to Piazza Brà, the central and largest piazza in Verona. Verona's amphitheatre is located on the northeast side of the Piazza, dates to around 30 AD, and is the fourth largest surviving example in Italy after the arenas at Pozzuoli & Capua as well as Rome's Colosseum. It measures 139m x 110m. While it appears to be fairly well preserved, it is missing nearly all of its original outer ring. Despite this, the interior seating has remained intact enough that it is still used to this day as an entertainment venue. See it on a map. Known as the Flavian Amphitheatre and more commonly as the Colosseum (or Coliseum), this was one of the first things I encountered in Rome. I arrived at the train station, booked a hotel just south of it, dropped my stuff off, and then headed back out to explore. The Colosseum was the first monument I encountered. At 188m x 155m this amphitheatre is the largest surviving example in all of the former Roman empire. 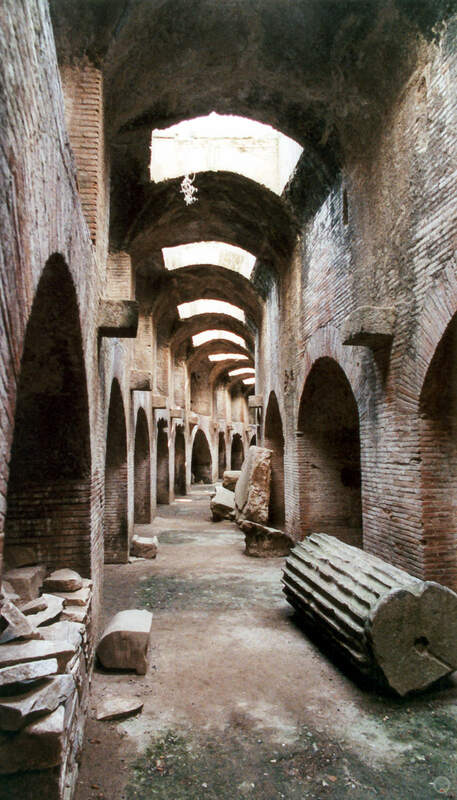 Construction was begun by emperor Vespasian in 70 AD and was completed by his successor and heir, Titus in 80 AD. It's estimated that it could have accommodated between 50,000 to 80,000 spectators. It may have even had the ability to be flooded for mock naval battles, though that continues to be a matter of debate among scholars. See it on a map. From Rome, I headed south by train to Naples. Along the way, I stopped at Santa Maria Capua Vetere and walked a few blocks north from the train station to the amphitheatre. It dates to the time of Augustus, but was later restored by Hadrian and dedicated by his heir Antoninus Pius. It is one of the largest still in existence measuring 170m x 140m. Within Italy, only the Rome's Colosseum is larger. 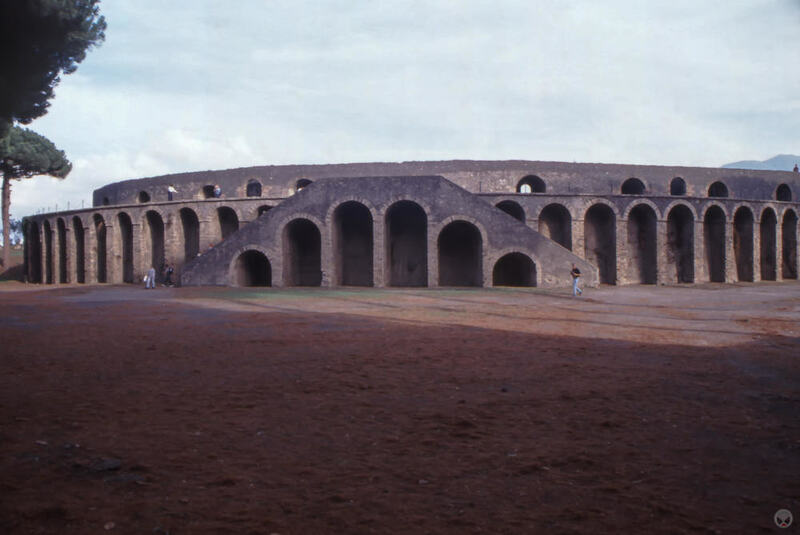 Like the arena at Verona, Capua's example is missing most of its original outer ring. In fact, only two stone arches of it remain. Unlike Verona's, it is too heavily ruined to still be used as a functioning entertainment venue. However, its subterranean chambers are still intact. See it on a map. 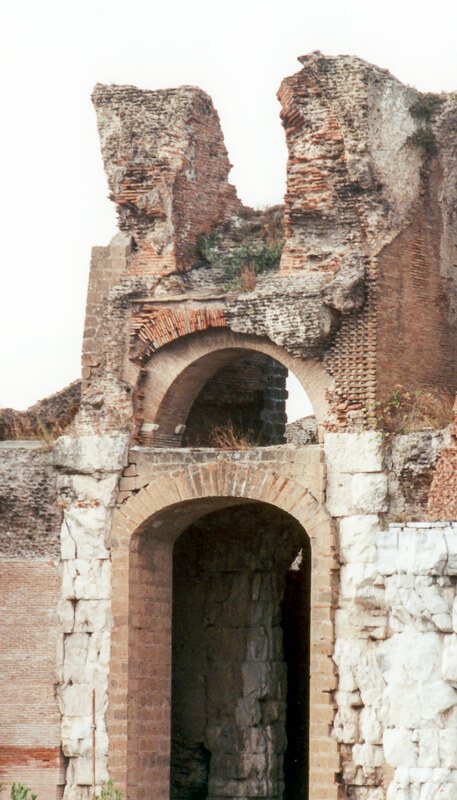 While I was staying in Naples, I ventured east by train to Pozzuoli one morning, where there are two amphitheatres to be found. The first is easy to miss if you aren't looking for it, however if you are, it is easy to find. In fact, the train runs right through it! It is mostly unexcavated, but several bits can be seen along Via Solfatara and Via Vigna just before those streets run under the rail line. It's actually more easily seen when going through it on the train. It measures roughly 130m x 95m I didn't happen to grab any photographs of it when I was there, but you can see it on a map. You might even able to see more if you head over to google maps and then enter the street view mode. 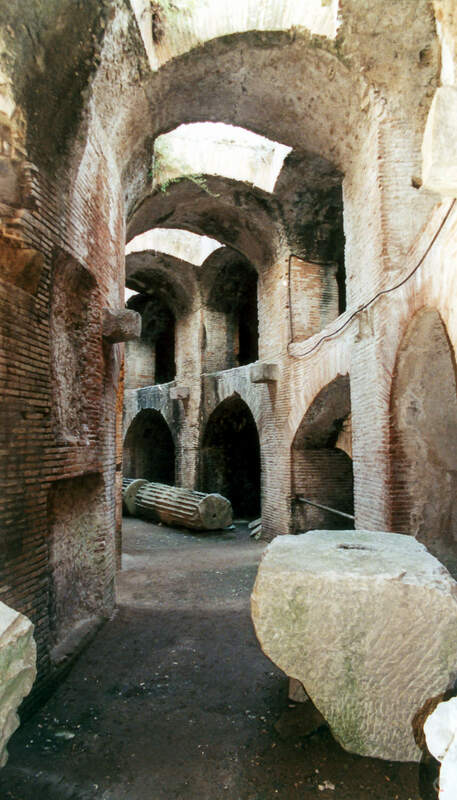 The second amphitheatre at Pozzuoli is, like the one in Rome, also known as the Flavian Amphitheatre. It can be found just across the Via Solfatara from the smaller amphiteater. Both are an easy walk from the train station. At 147m x 117m, it is the third largest in Italy (behind those at Capua and Rome). It dates to about the same time as Rome's and was also likely begun by Vespasian and finished by Titus. It is estimated to have had a capacity of 20,000 spectators. 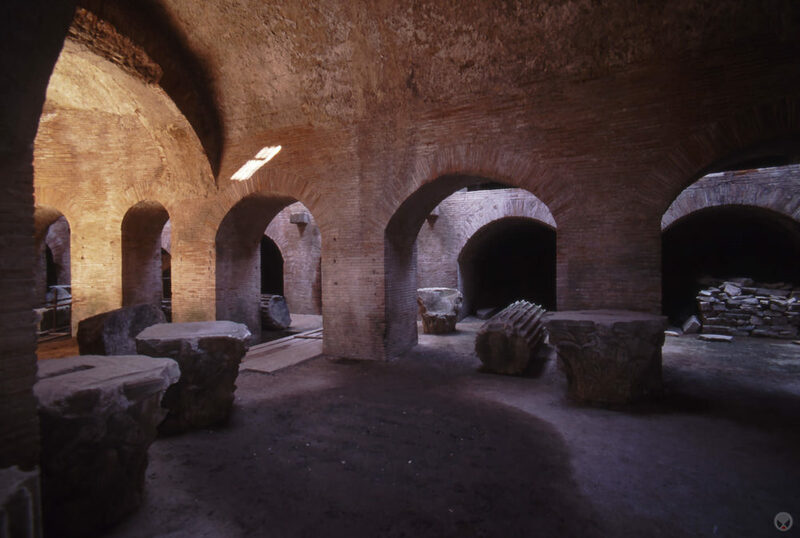 Of particular interest are the subterranean chambers, which are among the best preserved of all ancient Roman amphitheatres. See it on a map. From Naples, I again ventured south by train to the Amalfi Coast. The following day, I left Positano and daytripped back north to the ruined city of Pompeii. 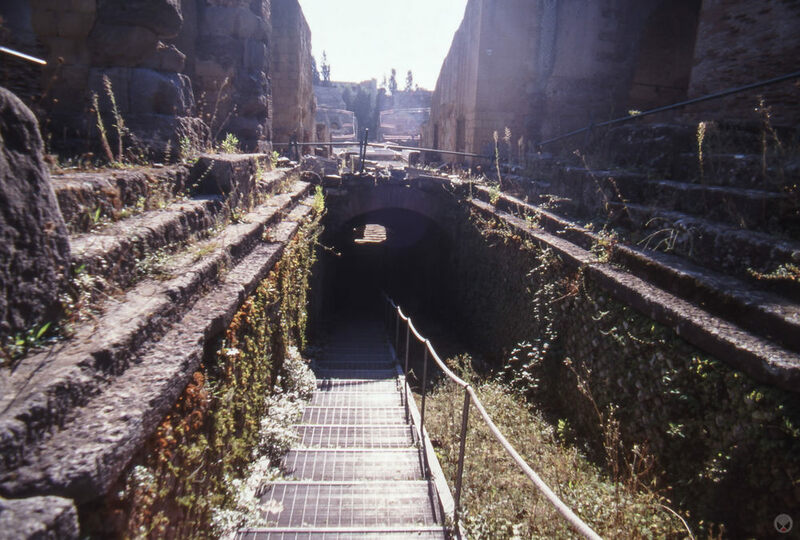 The Amphitheatre of Pompeii dates to around 70 BC and is one of the oldest known Roman amphitheatres. It is also the first known example to be built of stone rather than wood. In October 1971, Pink Floyd spent several days making their film Live at Pompeii in the stadium. See it on a map. The day after I visited Pompeii, I made another daytrip from Positano south to the ruins at Paestum. The amphitheatre dates to around 1 BC and is much less elaborate than the larger examples I saw. It lacks both upper and lower levels and is little more than a ring of stone seats elevated above the arena floor. Only half of the structure is visible. A road, insensitively sited in 1930, runs over the other half. See it on a map. From the Amalfi Coast, I to took a bus east to Salerno, where I boarded a night train to Sicily. After a few days in Sicily, I boarded a ferry across the Mediterranean to Tunisia. After a full day on the boat, I arrived in Tunis just after sunset. The following day, I rented a car and headed south. Many people - including those I work with in architecture - are ignorant to the fact that the Roman Empire was far-reaching. It went as far north as the UK and as far south as North Africa. The Roman town of Thurburbo Majus was begun in 27 BC, though much of the town was built in the second and third centuries AD. I suspect its amphitheatre dates to the second century AD, but I haven't found anything definitive on the subject. That's not terribly surprising, considering that this arena is little more than a ruined crater today. See it on a map. After visiting the ruins at Thurburbo Majus, I drove east to Zaghouan and then south to Kairouan where I would stay for the next three nights. Using Kairouan as a base, I spent a day visiting the ruins of Maktaris and Sufetula. The amphiteatre at Maktaris is similar in size and state to the one at Paestum - with the exception that it doesn't have a road running through it. The arena likely dates to the the second century AD. See it on a map. The amphiteatre at Sufetula is similar in size and state to the one at Thurburbo Majus - that is, a ruined crater. It likely dates to the the first or second century AD. See it on a map. After a few days in Kairouan, I headed east to Monastir and then south to the island of Djerba, stopping at El Jem along the way. The town of El Jem is absolutely dominated by the ruins of its Roman amphitheatre. Depending on what you read, it's between the 2nd and 6th largest discovered. However, UNESCO states its size as 148m x 122m, which places it just above the one at Pozzuoli, Italy (and noticeably smaller than the one at Capua). It has been dated to around 238 AD and had an estimated capacity of 35,000 spectators. It survived more or less intact until the 17th century, when it was used as a stone quarry. In 1979, UNESCO listed it as a World Heritage Site. Some guide books claim that several scenes from the film Monty Python's Life Of Brian were filmed here, however other sources dispute this and state the scene(s) in question were shot in Carthage. See it on a map. Another, earlier amphiteatre can also be found in El Jem. It is located near the present day rail line just south of the larger amphiteatre. It is more "ruined" than the one at Maktaris, but not quite as bad as those at Thurburbo Majus and Sufetula. I have read that this is the second amphitheatre of Thysdrus (the larger, impressive one being the third) and that it was built on the same site as the first amphitheatre of Thysdrus, which was likely a wood and earth construction. See it on a map. And that's the dirty dozen! In my next post, I'll cover a dozen others I just missed seeing.